This post has been sponsored by Behr. All opinions are my own. Being a “boy-mom” is one of life’s greatest adventures! But, especially if, like me, you didn’t grow up with brothers, being a boy-mom has its own set of crazy, unexpected surprises and challenges. A few months ago, my dear husband casually asked me if I had noticed the hundreds of black marks and fingerprints on Blake’s bedroom ceiling and walls. Wait, what?! We have 10 foot walls! But sure enough, every place that could be reached was covered in little fingerprints. To get to the ceiling, he also used his headboard as a platform to literally dive into the bed. How I had not heard this is unfathomable, but he does have a really heavy-duty bed. We spent hours trying to clean them off, but the walls were covered in smear marks and slightly-less-but-definitely-still-there greasy fingerprints. Time for new paint and a plan. 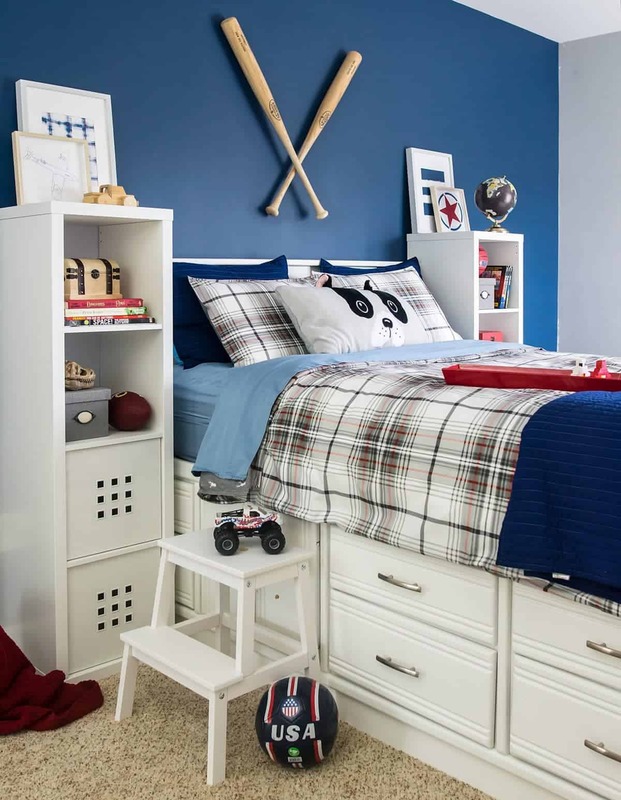 Here are some great tips about designing a boy’s room that is going to last. Start with a color palette that you might use elsewhere in your home. 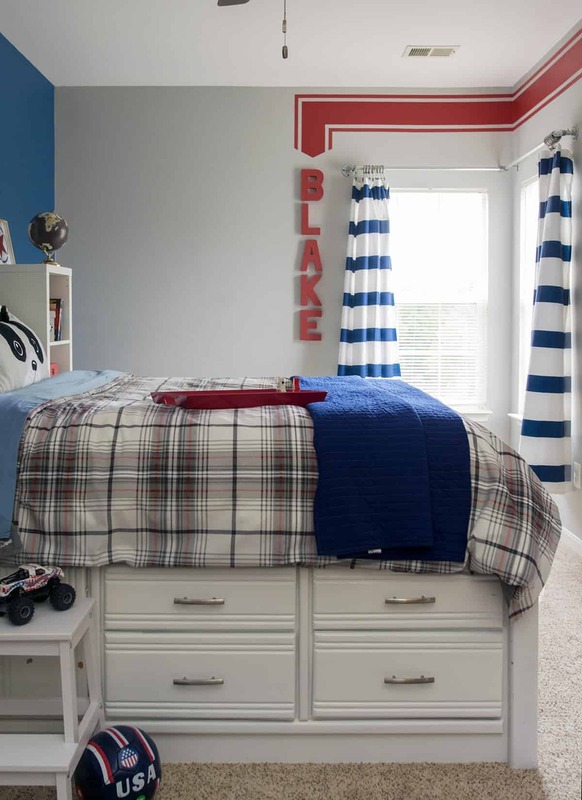 However, it is a child’s room, so there is more room for additional pops of bright or primary colors. It’s all about balance here, and you don’t want to go overboard. If using bright accent colors, stick with 1-2 colors and spread them around the room to create little pockets of joy that draw the eye around the room. For Blake’s room, I wanted a design that is easy to incorporate, colorful, and hopefully would grow with him into his teen years, but also something that I could easily change if his tastes went into a totally different direction. Red, white, and blue is such a classic boy bedroom color scheme and, frankly, I didn’t want to buy all new everything to fit the paint. The budget rules all. For the color palette, I chose BEHR PREMIUM PLUS® Interior Paint and Primer in Tidal, Morocco Red, and Planetary Silver which I found easily at Home Depot. To get the best adhesion possible, we washed the walls with TSP (tri-sodium phosphate) before painting. Bye dirty fingerprints- and keep reading to learn an easy solution on how to keep those away long term! There’s just something about that first moment of opening a paint can, especially when you picked out the color, isn’t there? I always get so excited. Especially in kids’ rooms or high traffic areas, I want a durable paint that resists dirt and grime and Behr Premium Plus Paint is highly rated by me and my family. Before we get to the after, I wanted to share a simple trick we used for making art on the cheap. I used the leftover paint and simple patterns like plaid or stripes so that my son could create his own art for his room! We had so much fun doing a few different designs and then picked our favorites for the room. I love the storage of a captain’s bed but one of the challenges with its size is that nightstands don’t work well. I’ve been looking for a solution for a long time when I finally thought to put bookshelves on either side to hold what he needed like books, a clock, and a reading lamp. They also make the bed feel more cozy. While I am really hoping he learned his lesson about smearing dirt on the walls, I live in boy-mom reality. I know that jumping on the bed or putting fingerprints on the wall is just too tempting when Mom isn’t looking. And to be really honest, dark colors have a tendency to show marks even more. 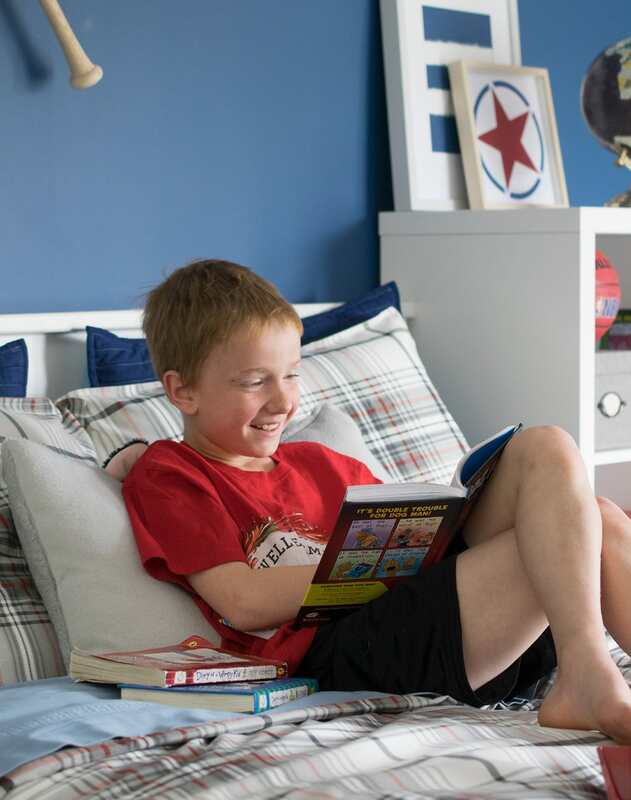 As he is at the age where it is his job to keep his room clean, we purchased BEHR SWIPES™ Interior Wall Wipes to help keep the paint looking fresh. The best part about these wipes are that their paint-safe formula cleans and maintains the full spectrum of paint colors and sheens while also safely wiping away dirt, fingerprints and other stains commonly found in active households they are safe for colors and specifically formulated for painted surfaces. I also think BEHR SWIPES™ will be a great way to keep his painted furniture, like this step stool, from getting too grungy. Kids can be hard on furniture, and white is a risk, but his has held up well so far. You can pick up these wipes in the paint aisle at Home Depot as well. And if you’re a boy-mom like me, I can’t recommend them enough! I am hoping the baseball bats deter him from climbing on the headboard again. As you can see, even though we used two competing bright colors, we balanced them by simplifying the space with small accents around the room. For example, I wanted to add a bit more red in the color mix without competing against the Tidal Blue, so I repainted the stripe with Morocco Red on the opposite wall as an accent. The white and light gray of Planetary Silver helps to unify the room overall. My sweet, energetic boy is loving his room. We are gearing up for his flag football playoff game this weekend, but I have a feeling he’s contemplating next season’s sport in here or what his big summer adventure will be. I wish I could borrow some of that energy! We still have some more work to do on the rest of his room, and our master bedroom might be our next project but I can’t decide. Little by little, and with a few simple projects, we will get there, but I’m finding more time and joy lately in his room. Giant forts and flashlight story telling are the best! After all, they grow so fast, don’t they? Thank you! I actually did a post on how I created the arrow stripe with painter’s tape here: https://www.cravingsomecreativity.com/boys-room-painting-idea/ It’s an older post and the arrow was originally orange, but it’s got good information in it. I love the colors and it looks so clean and bright! 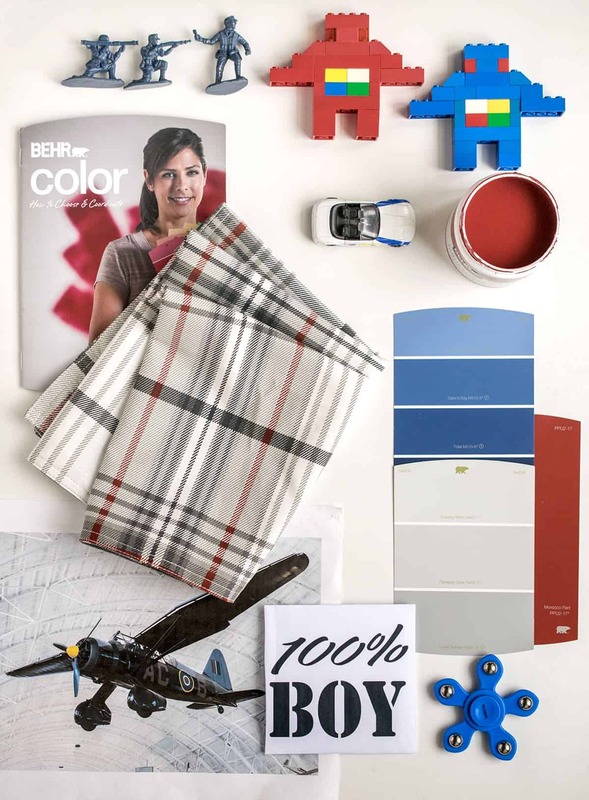 I was *just* looking at color swatches from Behr at Home Depot a few days ago (also for my son’s room!!!) and pondering about which shade of blue to choose! I love the color scheme you used here!! Thank you! It’s a great color scheme for a boy. Fun but not too loud, and he loves it. I am doing my sons room in a puppy dog theme! Where did you find that pillowcase?!? Adorable! Hi Carrie! I purchased the pillow at Target. It’s called the Frenchie Body Pillow Gray. It may be at your local store. However, I tried scouring the internet for it and cannot seem to find it now. What a cute theme idea! It definitely looks like a room I would have wanted to have when I was a boy. Having all those sports things and the way to hang things on the walls and the colors are all great. Love how you decorated his room! My husband’s name is Blake. We are in the process of doing our sons rooms since we just moved. Omg how freaking cute is this!! I love the baseball theme with a few airplanes. Definitely stealing some ideas! you’ve done an amazing job! Looks like a page straigt out of a magazine! And the art project oh my gosh! Is it weird that I want to recreate that too and I’m an adult?? Love it! Haha, it not wierd at all. It’s like doodling which is a good stress reliever. I know I could use a few de-stress activities like this. I wasn’t sure how I would feel about those colors until I saw them up on his wall. Love it! Simple but grown up enough to make it through the teen years. What a great room. I love the colors and it looks so clean and bright! The room turned out great! I love the color and your art idea was perfect for using up left over paint and adding art! This is so cute! I love what you did with his room and it looks so spacious! This is such a cute room, job well-done! You did an amazing job with that bedroom. 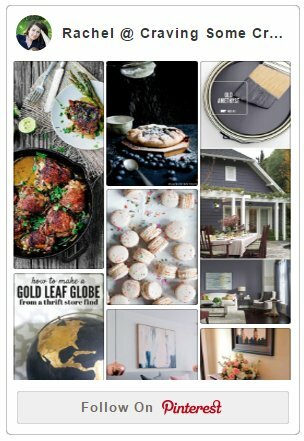 It looks like it came out of a magazine! I really wanted a boy and was so happy for the adventure! Love the makeover. That bed is so great! I always like space saving furniture. Totally agree! Space saving furniture is the best. Rachel, this makeover came out so beautiful! I love the bedding and those bats above the bed!! The wall color is perfect in this space, nice job! Pinning!